Nagygyimót is a village in Veszprém County in Hungary near to Town of Pápa (8 km east) in the Little Hungarian Plains. The village has got 671 inhabitants (1990 census) nearly all of them are Hungarians. The first mention of the village is from 1225. At this time the landlord of the village was the Chapter of Várad (now Oradea / Nagyvárad/ in Rumania). Later landlords were: the Amadé Family, the Chapter of Veszprém, the Csoronok Family and the Esterházy Family. All the settlers of the villages was serf. 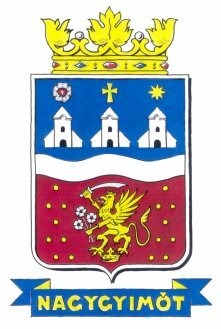 In 1910 Nagygyimót was a village in the Pápa district of Veszprém County. Number of inhabitants in 1910: 1.197; 1.196 (100,0%) Hungarian and 1 others by mother tongue, 739 (61,7%) Roman Catholic, 266 (22,2 %) Lutheran, 182 (15,2%) Calvinist and 10 (0,8%) other by religion. The flag, the CoA and the seal were adopted in 15th August 2000. Description of the Coat of Arms - The three silver churches in the blue field relate to the religious mosaic of the village. The gold Latin crucifix relates to the Roman Catholics, the Luther's Rose within red heart and in the heart the silver crucifix relate to the Lutherans and the gold star relates to the Calvinists. The wavy silver stripe relates to the Séd Brook. In the red field the gold griffin relates to the landlords of the village - the Esterhazy Family. The sixteen gold coins relate to the former richness of the territory. 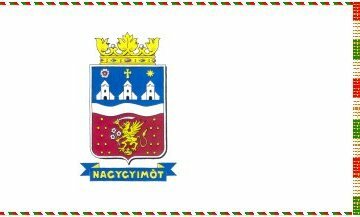 The crown over the shield relates to the former noble settlers of the former Kisgyimót village (now is the depopulated territory, part of Nagygyimót).